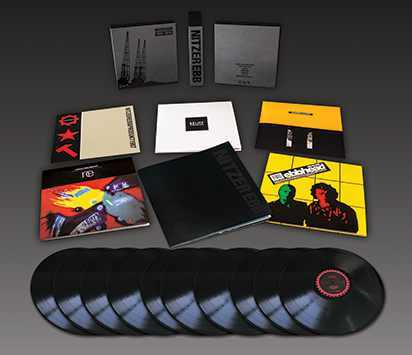 Pylon Records will release Nitzer Ebb 1982-2010: The Box Set, in October, a new 10LP vinyl package that includes newly remastered versions of all five of Nitzer Ebb‘s Mute/Geffen albums and five additional vinyl records of bonus tracks and rarities. The electronic/industrialists’ career spanning box features expanded double black vinyl sets of That Total Age (1987), Belief (1989), Showtime (1990), Ebbhead (1991) and Big Hit (1995). Each come with several bonus tracks and 12-inch mixes – all curated and remastered by Pylon Records. The original artwork has also been expanded into gatefold sleeves, with embossing and spot UV finish. It also contains a large size booklet with liner notes by the band’s co-founders Douglas McCarthy and Bon Harris, along with unseen photos, flyers and artwork, detailing their entire career in chronological order from Essex to Los Angeles. Limited Edition Gatefold Spot UV Foil Sleeve, containing two black vinyl LPs, with seven bonus tracks, including the highly acclaimed “AS IS” EP along with remixes by Vince Clarke, Barry Adamson and Flood. I have no interest in Nitzer Ebb vinyl of the albums. I put up with 12" singles with mixes not on the CD singles. I prefer the clinical purity of CD particularly for electronic music. I am looking forward to their new album, though. The last one was great and I'd given up hope that there would be another one. here's a breakdown of the bonus tracks. nice spot, but will wait until they are officially mentioned, since there is no news anywhere else. Deluxe Editions are able to be pre-ordered on Amazon now. ApolloZero wrote: Deluxe Editions are able to be pre-ordered on Amazon now. that's better. but still not official. Sad way of tricking the fans into buying a vinyl-boxset that they possibly wouldn't have bought if they knew before deluxe cd-editions were coming. Just hope many fans will find out earlier + at least have the chance to cancel their pre-order if they want to. Hopefully, these will be cheaper to snag in Canada than the US-only release. Someone like CDWow/WowHD should get into the business of worldwide distribution for smaller labels, so people don't have to deal with importing from country-specific sites, shipping costs, and foreign currency. The label would get more sales because the prices would be consistent for everyone, everywhere, and CDWow would actually get business again.